In a daytime strike over the area around Damascus on Sunday, January 20th, the Israeli Air Force dropped hundreds of bombs on weapons stores and bases it believed to belong to the Iranian Revolutionary Guard Corps (IRGC). A subset of the Iranian military operating out of Syria, the IRGC had launched a medium-range missile into the Israeli-claimed Golan Heights earlier that day, for which the Jewish state was seeking retribution. And so, in broad daylight, and then more covertly at 1:00 AM on Monday morning, Israeli planes glided over Southern Syria, destroying key Iranian and Syrian armaments and killing an estimated 11 people, most of whom are believed to be Iranian. For days, Russia, a major outside power and a key ally of both Syria and Iran, simply kept quiet. In the context of the ongoing clash between Israel and Iran, the weekend’s exchange might at first appear unworthy of special remarks. After all, the two Middle Eastern states have been fighting one another in the Syrian sandbox for years, both taking advantage of—and further perpetuating—the chaos of the Syrian civil war that rages around them. Iran’s Quds Force, an elite branch of its IRGC, has vowed to destroy Israel and support the Lebanese terrorist organization, Hezbollah, to that effect. Israel, accordingly, has resolved to force Iran out of Syria, cutting it off from its Lebanese client by periodically bombing Iranian outposts and troops. But, upon closer examination, this latest round of fighting was more than merely another development in the near-rhythmic churn of violence we have come to expect in the region. There are rarities contained in these events—two major deviations from Israeli protocol that are better explained by examining the country’s relationship with the Russian power thousands of miles away. A map of the region showing the Israeli-occupied Golan Heights in a lighter shade and Damascus to the northeast. First off, since chaos broke out in Syria in 2011, the Israeli Defence Forces have upheld a policy of “ambiguity” when it comes to publicity of their typical anti-Iran strikes. Rather than taking direct responsibility for their military accomplishments in this theatre, the Israeli government has historically waited for any word of a strike to trickle back into Israel through international, observational reporting. In refraining from confirming or denying its aircrafts’ violations of Syrian airspace when they occurred, Israel tenuously avoided mounting an overt challenge to the sovereignty of the Assad regime. It is, thus, through this ambiguity that Russia has been able to simultaneously strengthen Assad’s grip on power and tolerate Israel’s concurrent anti-Iranian endeavours on the same soil. In the past few weeks, however, the Israeli military has gotten remarkably—almost suspiciously—candid about its operations. On January 11th, outgoing Israel Defence Forces Chief of Staff, Lt. General Gadi Eisenkot, conducted an exit interview with the New York Times in which he conspicuously acknowledged that Israel had struck “thousands of targets” tied to Iran in Syria. Just two days later, Prime Minister Benjamin “Bibi” Netanyahu joined in on the sudden transparency, announcing with characteristic drama that Israel had attacked Iranian weapons depots around Damascus earlier in the week. And, in the most recent strikes, Israel seems to have reinforced its abandonment of “ambiguity,” confirming hits on Iranian and Syrian targets, via Twitter, in real time. As Jerusalem has become more brazen about its successes, Syria-backing Moscow has mustered little more than a murmur. The country’s only statement on the recent bombings arrived several days late, when a spokeswoman for the Kremlin meekly called on Israel to “stop its arbitrary strikes” in the region. Aside from vague urgings to “consider the possible consequences of provoking a new round of chaos in the Middle East,” the rebuke was lukewarm at best. Unlike in September, when skies clouded with Israeli jets triggered an infusion of powerful rockets into Syria, Russia has not signalled any sign of similar ire this time around. One wonders why the Jewish state has chosen this moment to be so bold, and why, on the other side of that coin, Russia seems to have chosen this moment to let them. In an article published late on January 21, Ha’aretz’s Anshel Pfeffer offered his answer: both the Kremlin and the White House “simply don’t care” what Israel and Iran get up to against one another, and therefore, Israel need not fear the reactions of the two global powers to its adventures into neighbouring lands. The United States is disinterested in direct intervention on Israel’s behalf against its web of enemies, and is hightailing out of Syria regardless. Meanwhile, Pfeffer writes, Russia has achieved its primary objective of tilting the civil war in favour of the Assad regime. It has no incentive to expend any more of its resources fighting the peripheral battles of its Iranian and Syrian allies, especially when such battles would engage a bona fide military power (Israel) with which it is not in conflict. Yet such an explanation ignores the fact that Russia and Israel are not merely “not in conflict.” Gradually, in fact, they seem to be moving toward an arrangement that walks and (quietly) talks like an alliance. Since 2015, the two countries have had a policy of “deconfliction” in the region—an agreement for military coordination that gives Israel free-reign to launch strikes on Iranian and Hezbollah targets in Syria, provided that the country’s air force does not cloud Russia’s own pro-Assad operations there. Under the auspices of deconfliction, Putin and Netanyahu—and their respective defence ministers and military officials—have met numerous times, yet few know precisely what enters into these discussions behind closed doors. In December, an Israeli military delegation ventured to Moscow for a meeting with their Russian counterparts, the first of its kind since the September downing of the Russian plane and the shipping of the S-300s. On January 29th, Netanyahu himself met with envoys of Putin in Israel, the stated goal of the talk being to avoid the sort of “friction” between the two militaries triggered by the January 21st strikes. Descriptions of all of these encounters remain vague, though, with little elaboration on the nature and extent of future collaborations. Taken all together, this amassing collection of timestamps and statements offer the world the contours of an incredibly important black box. 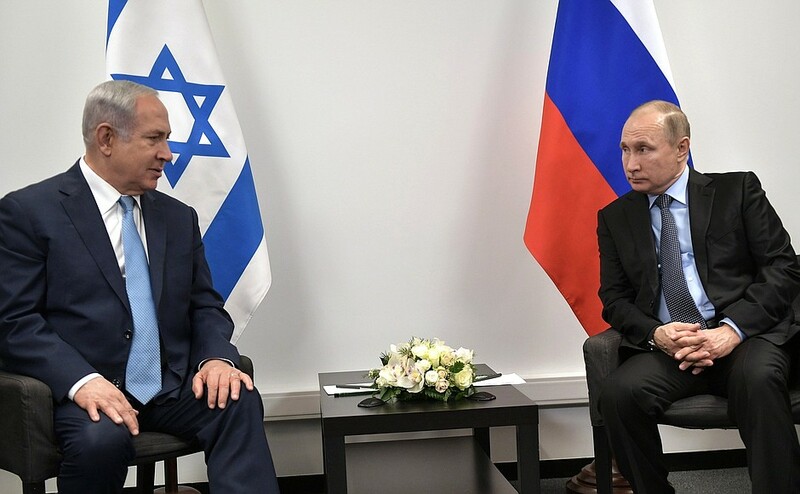 Though observers are increasingly cognizant of the budding camaraderie between Israel and Russia, the actual agendas of these myriad meetings, the substance of the military briefings, and the meanings of knowing looks from one leader to another remain somewhat of a mystery. It’s all shrouded and opaque, creating what former U.S. Defence Secretary Donald Rumsfeld might call the largest “known unknown” in the kaleidoscope of this conflict. The very fact that one cannot draw full conclusions about these two states from the fragments of their interactions is, in itself, a conclusion of sorts. It may signify the existence of a strategy below the surface—of potential intelligence tradeoffs and other internal bargaining that might have allowed these most recent strikes to occur, but which may punish Israel severely in the future for similar behaviour. Might Moscow only be waiting for the right moment to reaffirm its commitment to Syrian (and Iranian) allies, arming them heavily once more against the Jewish state? Or, will Anshel Pfeffer’s prognosis bear itself out and Russia recede from prominence in the region? For now, all one can predict is further unpredictability. After all, the dynamics of this conflict are better demarcated by steely glances and closed-door meetings than they are by the dotted lines on a given map. Sarah is a U1 student currently pursuing an Honours degree in Political Science with a minor in History. She specializes in American and Middle Eastern politics, and enjoys long walks through McLennan and coffee.